Here is lovely Anna…her senior portraits! Congratulations Anna! So glad to have met you and honored to have captured your sweet spirit and grace! 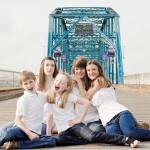 What a sweet family…all the way from North Carolina, visiting family for Easter weekend and family/senior shoot! It was an honor meeting them! What better location…beautiful downtown Chattanooga! So glad the faithful jogger/walkers were not out while we shot these…it was a beautiful morning!